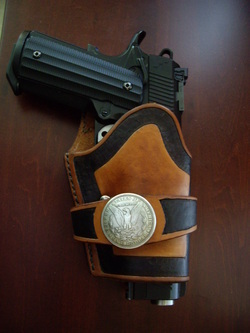 I am a custom holster and other Leather goods maker. For those that need to have something a little stronger, a little more durable, and custom designed for their specific needs. This is a Hobby Business for me. It's almost a non-profit. I work, take care of my family, go to school, and have responsibilities with my church. I make leather products because I like to, the sales I do have help fund the hobby. I don't expect to turn this into a full time business. I thank you for your interest, and your patience. Repair of Leather equipment, or goods. I am a proud husband, and Father of 2 beautiful girls. I have a full time job as a Commercial Insurance Agent. So this is a hobby for me. I work leather because I like to. I've been making holsters for about 6 years. Everything is hand made, all by me.